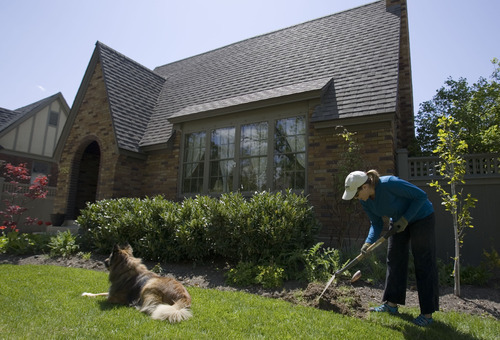 A Yalecrest resident does yard work in front of her Tudor-style home on Herbert Avenue in 2010. On Wednesday, the Utah Senate gave final approval to a bill that would create a one-year moratorium on forming a historic district in the east Salt Lake City neighborhood. The Senate gave final legislative approval Wednesday to bill that would create a one-year moratorium on forming a historic district in the Yalecrest neighborhood of east Salt Lake City. Such a district would prevent construction of large "McMansions" amid older Tudor homes there. The Senate voted to pass a House-amended version of SB243 by Sen. Wayne Niederhauser, R-Sandy, and sent it to Gov. Gary Herbert. The Yalecrest area covers about 1,400 homes. The legislation would allow homeowners to tear down 75 percent of their current structure during the moratorium. In the course of the year, local groups would study any need for a historic district. Earlier in the House on Tuesday, Rep. Brian King, D-Salt Lake City, who lives in Yalecrest, said the bill was a big government overreach into a small local area. "This is a 5-by-6-block area," King said. "The state of Utah is reaching its hand not into a county, not into a city, not into a community, but into a 5-by-6-block neighborhood." Niederhauser, who is a real estate developer, has said he was approached by historic district opponents to establish a statewide ban, but the bill was amended to zero in on Yalecrest. Moratorium backers fear a full-fledged historic district would infringe on property rights and restrict remodels too tightly.